I love creating homemade paint recipes. With all of the apple scented fun we've been having lately I decided to combine apple scents with our puffy paint recipe. I'm back with another apple scented paint recipe! I have to admit I think I might be a little obsessed with apple scents. We just been having the best time with apple recipes to play this fall. 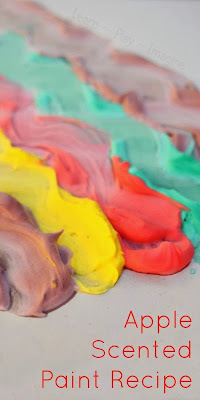 From apple pie dough, erupting apple sidewalk chalk paint, and apple scented quick paints to candy apple rice, apple playdough for fall and apple scented soap foam, we just can't get enough apples! We always have a batch of no cook puffy paint on hand, so when we used up our last batch I immediately knew that I wanted to make candy apple puffy paint. I'm so glad I did, because the paint smelled incredible. Directions: To make the puffy paints I poured the ingredients to a ziploc baggie, one baggie for each color. I used 1/3 cup of flour, 1/3 cup of salt, and 1/3 cup of water for each batch. You can easily modify the recipe for the quantity you want by using equal parts of those three ingredients. Add the flour and salt first. Then add the color and scent. The flavors and colors I made were candy apple red, apple cinnamon green, golden delicious yellow (scent free), and caramel brown. Due to the white base of the paint recipe I used quite a bit of color for each batch. I squeezed the bags well to get all of the lumps out and to mix the ingredients well. Lumps of flour can clog the squeezy bottles. If this happens, simple remove the lid and rinse it under warm water to clear the blockage. By mixing in ziploc baggies I am able to avoid lumps. Once mixed well I cut the corner of each bag and add to the squeezy bottles. The bottles I use are small, so I need a funnel to help get the paint inside. With standard bottles you should be able to pour directly from the ziploc bags into the squeezy bottles. I say this every time I write about homemade puffy paint, but it is always worth mentioning. Kids love to paint with squeezy bottles, and the muscles used to squeeze are the muscles needed for writing. By painting with squeezy bottles, children are building fine motor skills all while having fun! I love watching Peanut (26 months) focus while he creates. JZ (6) thought it was cool to squeeze two bottles at once and create identical designs in two colors. J-Bug (4) is my storyteller. He tells me tall tales while squeezing the paint. He paints and paints while making up stories with strong plots and characters. It's really quite amazing. I love listening to him. One of my favorite things about painting with my boys is watching them create together and individually at the same time. One of the best things about this homemade puffy paint recipe is that the paints last for months and months. Sometimes the water separates when it sits. I just shake the paints and squeeze off excess liquid into the sink before use. If you like making your own paint, be sure and check out our complete homemade paint recipe collection. Love it! How fun to have scented puff paint! I can't wait to whip some up. I'd love for you to come share this at our Pinning for Play link party! I was wondering what the paint is like once it's dried (after they create their masterpieces)? It remains raised and dries solid. It is less shiny when dry. We have paintings hanging up in our hallway that were made using this recipe almost a year ago, so it lasts long. It will flake off if picked at. We've never tried puffy paint, this looks like a lot of fun! Hi I love your recipe because it is soo easy with exact quantities. I came across another recipe here: http://www.mommy-labs.com/creative-kids/art_craft_projects_kids/enjoying-the-art-and-science-of-microwave-puffy-paint/ I fused the 2. I added baking powder to your recipe. Gave the kids the paint & let them go wild painting paper plates. Therafter, I microwaved their artwork for about 30 sec. My 2 were awestruck by the result. Thank you for the wonderful recipe & the handy tips like using a ziploc bag & squeezy bottles, makes it soo easy peasy & fun. Can you use this on shirts? I have not tried it. My guess is that it would not last. How long will it takes for the puffy paint to dry completely?